Nest is the beginning of a new exploration of ideas. 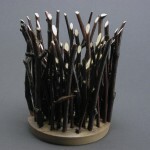 It consists of twigs collected in the New Hampshire woods, gathered into a small bundle which is mounted in a cherry base. 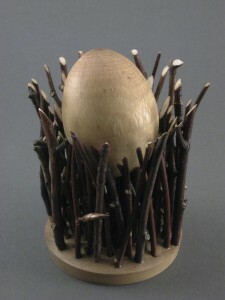 A steep parabolic hollow is then turned in the sticks, creating a “nest” that holds the egg. 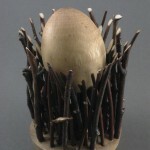 The egg is actually a box, turned from a branch collected from the side of the road. It was turned around Easter time, inspired by the plastic eggs in which one hides candy. Every box must have a surprise inside. 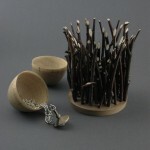 This egg contains a small, fully functional top of my own design, which can be worn as a pendant. The top hangs from a clip and allows for hours of spinning pleasure. I like the fact that this piece is three separate works, made over the course of three years.